On Wednesday night, Reform Immigration for America hosted a national community call to discuss the aftermath of the Supreme Court’s recent action on the expansion of the Deferred Action for Childhood Arrivals (DACA+) program and the Deferred Action for Parents of Americans and Lawful Permanent Residents (DAPA) program. 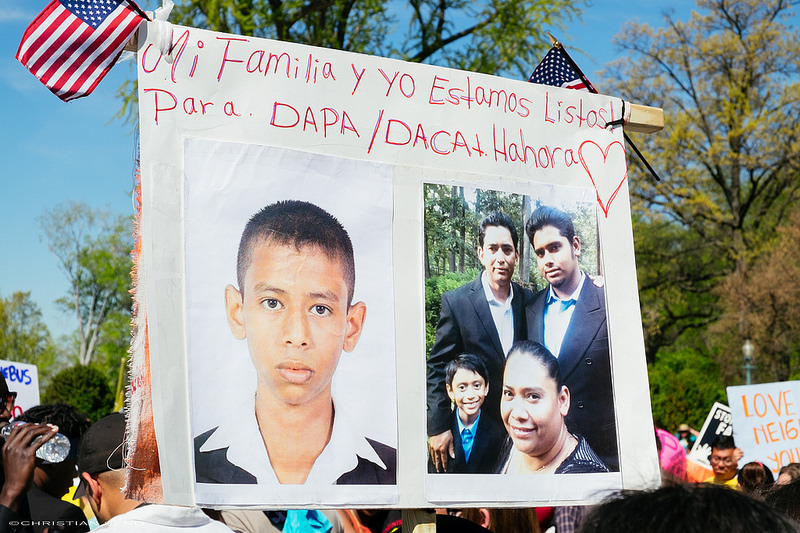 Featuring leaders, activists and individuals personally affected by whether or not DAPA and DACA+ may be implemented, the call addressed a variety of issues on the minds of immigrants and those who support immigration reform. As the NPQ nonprofit newswire wrote last year, the U.S. Supreme Court heard oral arguments this past spring in U.S. v. Texas to determine whether they would unfreeze President Obama’s two executive actions for DACA+ and DAPA. The two measures affect four million children and parents of children without documentation who have lived in the U.S. since 2010, and would allow them to remain in the country for three years if they meet specific criteria. Under both actions, decisions are to be made on a case-by-case basis; approval can be revoked at any time, and the measures do not guarantee a path to permanent U.S. residency or citizenship. Individuals can get a Social Security number and a green light for employment, and would be eligible for Social Security benefits after paying into the system for ten years (as is the requirement for U.S. citizens). The interpretation of those provisions that the Secretary advances would allow him to grant lawful presence and work authorization to any illegal alien in the United States—an untenable position in light of the [Immigration and Naturalization Act]’s intricate system of immigration classifications and employment eligibility. Even with “special deference” to the Secretary, the INA flatly does not permit the reclassification of millions of illegal aliens as lawfully present and thereby make them newly eligible for a host of federal and state benefits, including work authorization. On a community phone call Wednesday night with immigration leaders and activists from around the country, Marielena Hincapié, executive director of the National Immigration Law Center, put the SCOTUS action into stark terms, calling it a “non-decision” and concluding that the Court simply did not have the courage “to stand up to Texas.” However, while DAPA is therefore blocked from implementation in all 50 states, no precedent was established (because there wasn’t a decision) and she reassured participants on the call that the action does not affect the DACA executive actions from 2012—and that those eligible for renewal must come forward. Hincapié went on to note that following the deadlock, NILC immediately called on the Department of Justice to seek a rehearing so that when a ninth Justice is appointed to the Court, the case can be reheard. She recommended that groups sign onto a letter to the DOJ being circulated by the Fair Immigration Reform Movement (under Supreme Court rules, the DOJ must make that request by July 18th). The legal strategy is a long-term plan, however, and Hincapié cautioned participants that if the DOJ seeks a rehearing, the timeline for an ultimate decision would still be up to two years away, with proceedings likely to be in late 2017 at the earliest. The legal strategy, therefore, is just one of the tools that advocates will use in combination with ongoing organizing, policies, and strategies. To the latter point, Hincapié encouraged immigration reform advocates to continue demanding that the Obama administration makes sure that detentions and deportations are limited, and to get the administration to back off from its ongoing detention of Central American families. Paramount, in her opinion, is that the next president be supportive of immigrants. Gustavo Torres, executive director of CASA, was blunt in his interpretation of the Court action, calling out the justices for lacking the “courage and integrity to keep politics out of the courtroom.” He urged the call’s participants to stay involved. We will continue to fight to move [DAPA and DACA+] forward. It was the hard work of our families that brought the case to the Supreme Court. As to the remaining six million who don’t qualify for either initiative, we stand together with them. But this year, right now, our fight is also against hate and xenophobia and is in favor of dignity and comprehensive immigration reform that offers a path to citizenship. Torres encouraged the callers to see the setback as a catalyst for stepped-up advocacy and reminded them that Prop 187 in California, for instance, was a wake-up call for Latinos and immigrants. They began to organize. Their hard work paid off. I share this story to remind all of us that even when it looks most difficult, there is always a way forward. We need to demand and secure justice for our people. Register to vote. If you cannot vote, but know people who are eligible, encourage them to register and vote—to vote for you and your family, so that together the Latino and immigrant vote is heard loud and clear in these elections. Let’s join together to fight hard to stop this madness. Greisa Martinez, advocacy director at the United We Dream Network, spoke about the work that went into DACA in 2012 and DAPA in 2014 and urged callers to recognize the role they played in creating those victories. These weren’t “gifts” from Obama or the Democrats—we won them because we rose up and chose to fight. There are haters out there trying to take our victories away and push us back into the shadows. Our message to the haters is, we are not going anywhere. We are inevitable. Laura Veira’s inspiring story places a spotlight on the U.S.’s continuing inability (or unwillingness) to resolve immigration policy.